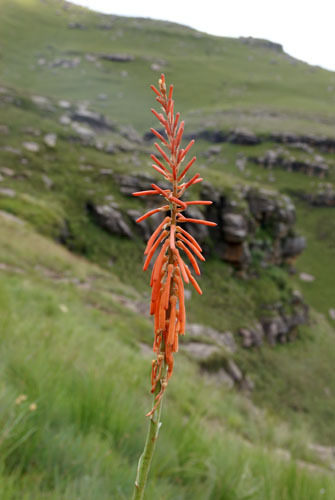 When I arrived at Elton Farm, my intention was to use it as a base for exploring Bushman’s Nek, where I hoped to find Kniphofia brachystachya. It had been recorded from a couple of sites in the area, although neither of the localities was very specific. However, one cannot ignore the imposing presence of Mount Sutherland, which lies directly behind the farm. Mount Sutherland is an outlying spur from the main escarpment. 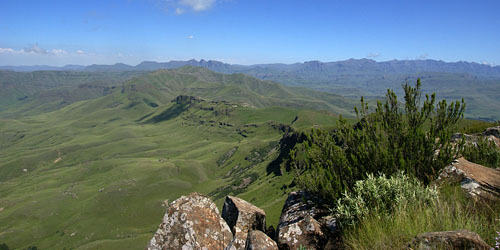 One of the localities for K. brachystachya was on a similar spur across the valley. I therefore thought that rather than getting into a car again, I would use the opportunity to walk directly from my cottage up Mount Sutherland. It would be fair to say that the gamble did not pay. There were no Kniphofia in flower at all on Mount Sutherland, although I believe I did find some non-flowering rosettes. It was too late now to change plans, especially after expending so much effort getting up there, so I decided to walk further along the spur towards the escarpment, sure that the next peak along the ridge would bring me some luck. It did not, nor the next one; it became a game of thinking that around the next corner my luck would change. In a way it did, just as I really was on the point of saying enough, I spotted a single spike of a Kniphofia laxiflora. It was not K. brachystachya, but at least it was a Kniphofia. A hunt around the area revealed a few more spikes, but with storm clouds gathering rapidly and my energy already used up, that was the end of my search. 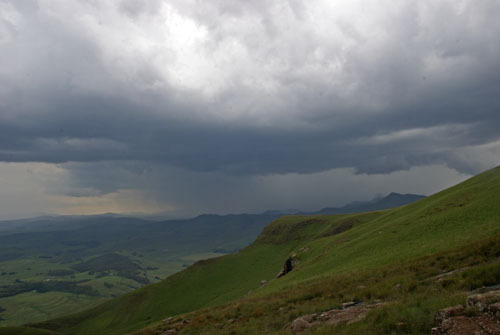 I then realised what a gamble I had also made with regards to the weather: some 8km from home across rocky slopes and rough grassland, the thunder started to roll around the mountains. Suffice to say, walking along an exposed ridge was not the ideal place to be, and a hike that had taken me 5 hours to get out, took me only 2 to return. The rain had started to come down and the lightning was striking all around as I got home, but fortunately at least the hail held off until I was inside. Flower of the day: Cyphia tysonii – looking superficially like an orchid, until one realises that it is actually a small climber twining round a stem of a rush. A member of the bellflower family, Campanulaceae. Animal of the day: Grey Rhebok – I surprised a herd of 20 or so of these as I reached the crest of Mount Sutherland. Unfortunately, they did not hang around long enough for me to admire them, as they bounded off down the slope with haste. I also came across baboons, a jackal and a, so my best day mammal-wise. 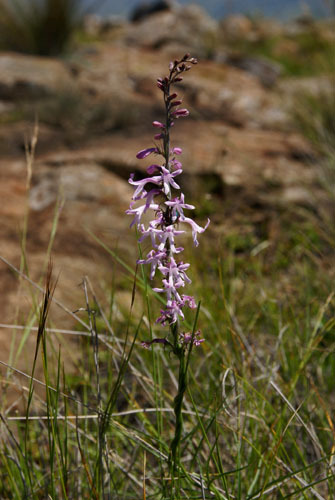 Cyphia, Drakensberg, grey rhebok, Kniphofia, Mount Sutherland. Bookmark.